Background: James Wuye and Imam Ashafa visited Washington, D.C. in October 2011 to launch the documentary An African Answer (about their mediation work in Kenya following the violence aftermath of 2008 elections) and met with Katherine Marshall on October 31, at the Berkley Center at Georgetown University. The discussion centered on how they came to work together, their sense of where Nigeria is today (including reflections on the roots of conflict), issues around health and faith in Nigerian, and their growing international work beyond Nigeria. I have heard you tell your extraordinary story of shifting from hatred and violence to peacemakers, in various places, including in the film about you, The Imam and the Pastor. How did you each come to the world of religion? (James) I was born in Zamfara State, in a small town. My father was a soldier and had fought in the Biafra war. We saw, immediately around us, war, violence, and tension spreading. I went to school in my town, then went to Kaduna where I studied theology. I wanted to tie my interest in international affairs with theological studies and enrolled with Link International, in Vision International University, which is based in Ramona, California. After my B.A. I went on to complete a master's degree in theology. I was brought up in the Baptist Church, but went to Catholic schools. As a result, I became a Catholic. And then I went to visit an uncle who was a keen member of the Assemblies of God, and after many conversations with him I joined them, and was ordained, as a pastor in the Assemblies of God Church. That is my spiritual home to this day. This journey gave me a good appreciation of the tenets of different Christian denominations. I became an activist in 1979, at the time I was graduating from high school. I was active as a young Christian person, very much involved with Church-linked youth groups. I subsequently became the representative of my church to several groups, including the Youth Christian Association of Nigeria. My desire was to do the work of God and I felt this calling with passion. I loved preaching and being a pastor and doing mission work. I also was very keen to bring the voice of young people into the national debates that were taking place. Drawing from those passions, I took on the leadership in a youth militia group. That was in 1992. (Ashafa) Teaching and leadership within in the Muslim faith was very much my family tradition. I was born in Mani Katsina State. My father was a spiritual leader, and I am now the thirteenth generation of Imamship in my family; it is a family trait. My family has also sought for many generations to build and strengthen the community. Most of my family were part of the Tijaniyya Order, and thus followed the sufi tradition. But my generation took a somewhat different path and that affected me also. We were very much conscious of the 1979 Iranian Revolution and heard Salafi preachers who came to Nigeria. The Saudi brand of teachings on Islam was very much present in Nigeria at that time and I became part of it. I dedicated myself to the reformist movement that they represented.. We wanted to purify, to recreate the true Islamic community in northern Nigeria. This movement reached its height in the late 1980s and early 1990s, and it represented a powerful cause. We were preoccupied with the threats we saw coming from the west and our fears were reinforced by what we heard about the Gulf War, Palestine, and Iraq. The Muslim Brotherhood in Egypt had a strong influence on Nigerian Muslim youth. Nigeria has faced long political struggles around the balance of power between Muslims and Christians and there is an agreement of sorts that power should be shared 50-50. I found myself defending the Muslim cause against the south, and also speaking against American power and influences. There was at the time a large Islamist youth movement and I was part of it, from 1978 to 1997, in various roles. I was coordinating the Muslim Youth Council: I was their first Secretary General. We pressed for Sharia to become the law of the states. Islamicization was our goal, a new form of evangelization. I then became a youth coordinator of an organization dedicated to preventing Christians from taking over in the north. 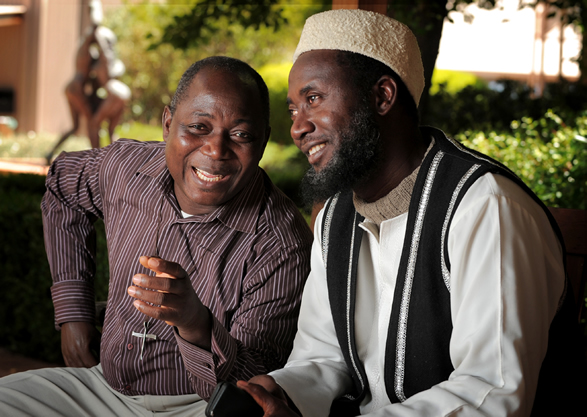 Was your father, the teacher and imam, part of these new currents affecting Nigerian Islam? (Ashafa) My father was never part of this new Islamic trend. He belonged to an older generation, as a senior imam and leader in the community. There was a serious generational divide at that time, and that was true also within my own family. His generation saw politics as essentially a dirty thing. They saw their challenge not as being part of the world but to be spiritual. They were anti-materialistic. The young people of my generation, however, were looking for Islamicization, so political factors were important. The imams from the older generation did not work to change others. They were concerned not to demonize others but to bring change through the heart and soul. They preach, they teach, but they did not see ill in others. But my generation saw it differently. We came to see that change following this route was too slow. We thought that new colonizers had taken the place of the old. My father’s generation was very significant because they served as counsel to the state even before it became the independent political authority. They had wide authority during the long and difficult transition period. But today, because they speak and read only Arabic, they have become essentially illiterate, because the language of communication has changed from Arabic to English. So they are removed from public life. My young colleagues expected me, as the son of the imam, to show the way. I had the gift of talking, sharing, of organizing, and making things move. So I had the privilege of becoming a leader within organizations and in working to put into effect the vision we had of a true Muslim community. What form does the evangelizing you speak of take? Is it within Muslim communities, or does it focus on efforts to convert Christians to Islam? Were you against the Sufi traditions of your father? (Ashafa) I speak of Islamizing, not evangelizing (except when I am speaking to non-Muslim audiences who can understand it only in those terms). Our efforts were mostly focused on purifying the practice of Islam within the Muslim community but also moving people to embrace Islam, whether from traditional religions or from Christianity. We were not so much against the Sufi traditions as against the political and social stance that some people who followed those traditions represented. I have studied comparative religion so I do know much about Christian history and Christian theology and their approach to conversion. Our approach is different and I see the fault lines very clearly. I have been part of many debates about what is right and the meaning of our religious history. We do have a center that focuses on conversion of Christians into Islam where we do training. The divisions within the Muslim community were very sharp at that time and they are to this day. The majority of Muslims are sufis and they are moderate. They belong mostly to two orders, the Tijaniyya and the Qadiriyya. They represent maybe 70 percent of the population. But the other tendencies (and especially the salafis), though they are a minority, are very vocal so they have far more influence. They represent new tendencies, with ideas that have come from other places. They also have this Islamicizing mission in a very different way from the more traditional groups and leaders. I came to be in charge of the combat center that aimed to defend the real Islam, against others from the south but also from those who sought to claim the land that Muslim citizens lived on. There were serious tensions between people over land, with some claiming that they had rights because they were indigenous, despite the fact that those who lived on the land had lived there for many generations. We wanted to train people to be good Muslims. This is one of the things that I have been doing for a long time, and I still have this task of coordinating the spiritual side. Sufi scholar Faouzi Skali, who created the Fes Festival of Global Sacred Music, has given me a deep respect for Sufi and Tijaniyya culture, which, of course, is important in Morocco, with pilgrims coming from all over to visit the shrines. Do you consider yourself a Sufi still? (Ashafa) My father is part of that so it is my heritage, but during my youth I came to say no to much of the sufi tradition. I saw it as too slow. But now I see it differently as I know more what a sufi order represents. It is about a deeper sense of being. I love that, and now I am proudly part of that. I believe that this sense of being is one of the most important principles that a sufi order holds very dearly. Do you see in Nigeria a sharp division between the Sufi and the Salafi elements of Islam? (Ashafa) Absolutely. For now, the Salafi are a minority. The dominant Christian denominations in Nigeria today are the Catholics, followed by the Anglicans,and others. But that does not speak to their influence and strength. The pastor will tell you how that works among the Christians. Who are the most outspoken? The evangelical groups are clearly the most listened to, though they are smaller in numbers. That echoes what happens within the Muslim communities. To turn to your current work, do you remember when you two first actually met? So you remember the moment? (James) Quite clearly. It is not something I could forget. It was not an easy thing for us to talk, and it wasn’t a meeting that we planned. We had no idea that we were going to be at the same place at the same time. Our meeting took place during a gathering that UNICEF had organized about child immunization. UNICEF had requested the government to assist it in bringing together religious leaders so they could be spoken to. UNICEF saw this as an important way of mobilizing people to bring their children to be immunized for poliomyelitis. That is where we both were, among the delegates from various grouping seen to represent different organizations and to hear and share. There were many there from different sects and denominations that are active in Nigeria, various movements, both Islamic and Christian. That’s how we met. So what happened that day? (James) We were brought together by a friend of mine who doubles as his [Ashafa’s] friend, Idriaz Musa, a journalist. He belongs to a committee that I belong to that is working against drug and substance abuse. So we had met several times in that context. As I said, he is also a friend of Imam Ashafa. He also knew people involved with the same issues within Muslim communities, especially those working with youth groups. And he was a government worker with the Ministry of Information, involved with the radio and television house. So he was also there to listen to what the government was saying about immunization. And that was how, during the tea or coffee break (whatever the case may be), he drew us together. He put our hands over each other’s hands and said to us, “I know you have the capacity to keep the state in peace. I want you to talk.” And then he just left us there. We were holding hands and looking at each other in a puzzled way. I said, “How are you, how are you,” just to be very polite. The imam asked if we could meet after the meeting. So I gave him my office address, where I was serving as the assistant of the Youth Association of Nigeria. (Of course we don’t give home addresses. Our training does not permit us to do that!) He came there eventually, and that begun the journey. So that is the long story of how, without intending it, we began talking. Before we lose this thread, we’re very interested in religious leaders and immunization. Did you in fact pursue the mobilization effort on polio? There were, we know, problems in Nigeria and leadership was needed to overcome fears and resistance. Were you involved in that or was your involvement in immunization simply the occasion on which you happened to meet? (Ashafa) The issue was then (and still is today) that there were stereotypes and prejudices and above all fears about motivations behind something like a vaccination campaign that came from outside. The fear was that immunization of children was really about the sterilization of those children and the women. So UNICEF came with its mission around the Millennium Development Goals and the rights of children, and we were looking behind that, asking, “What is their real agenda? Why are they coming to do an experiment on our children? Why are they focusing on this small issue when there are so many others that are more important to us?” We saw there an American and a European agenda. And then, secondly, there was the situation with a large company, called Pfizer, a German company that came and did experiments with the Nigerian children, experimentation with some of their drugs, the kinds of experiments that should be done on animals. But they did them on human beings, and there was a big disaster so it boomeranged, creating very serious negative challenges. The government sued Pfizer, and this added to the questions and suspicions people had about immunization. What is the hidden agenda? Why didn’t they do that in Europe? Why are they coming here? Why did they do this? It became a serious threat in Kano State, where the facts were not fully presented. There are stereotypes that run very deep among the religious population of Muslims in the world, very deep in the heart of many Muslims. There are over one billion of us and many are affected by these suspicions and stereotypes. All these are longstanding challenges of hate and misunderstanding between Europe, America, and the Muslim world. There were also issues for HIV/AIDS, and similar suspicions. The questions asked included: Who is making the drugs? Why are they being tried here and not elsewhere? How did you get the drugs? Who is giving the drugs? If it is true that AIDS is fatal and that it is present in our community (and initially we thought that it was not true, just a gimmick with suspicious motivations), but if it is true that there is AIDS in the population, then leaders and scholars argued that it is God’s punishment on us. Even when the disease is accepted as a reality and that medicines are needed to combat it, there is still a strong feeling that says, “We don’t want the drugs to come from Europe.” South Africa may be okay, but in the end it had to be India. On the polio vaccination case, at the end of the day, they set up a committee to investigate the drugs and decide which were acceptable and ideal. They concluded that it was acceptable if the drugs came from India. And the Sultan and some of the elders were vaccinated and, to make it acceptable. They had to bring their children out publicly to say, this is my child being given the immunization. With that, we were able to reduce the level of the stereotypes, but to this day they are still strong in conservative circles and there are leaders who insist that their children not be immunized. And that includes educated people, for example one nurse who works in hospitals. He himself was immunized as a child but will not allow his children to be immunized. He is a Muslim and he draws a line around immunization. In short, in the Muslim world the issue of immunization is very sensitive because of many factors and especially the unfortunate events that I have highlighted, both by private companies and by governments, some mistakes and some by design or part of poorly thought out experiments. Because of this, trust towards the whole Judeo-Christian world, especially Europe and America, are diminishing. There is a sense that we need to be on the same template across the Muslim World. But what we, James and I, argue is that instead we need to establish that we have a common God, common, shared values, moral ethics, and moral principles. That there is more in common among us than with others, for example South Asian traditions and political leaders. But for now, many Muslims in Nigeria are looking towards Asia instead of America and Europe. What about malaria? Is that as much of an issue? (James). No, it’s not an issue. (Ashafa) It is part of the same lack of trust, especially where expensive campaigns that dedicate millions of dollars seem to come from Christian nations. In this case there were suspicions about where the nets were made. When it was clear that they were made in Indonesia there was less of a problem. How successful do you believe the interfaith effort on malaria has been? The Sultan and Archbishop Onaiyekan were the co-chairs. (James) That has changed, and the co-chair is now Pastor Ayo Oritsejafor. Archbishop John was voted out (as head of the Christian Association of Nigeria). He was supposed to serve two terms but I think the Christian community felt that he was not quite representing them. That is the process: if someone does not do well, he can be voted out at the end of his tenure. The new president, Ayo Oritsejafor, is the President of the Pentecostal Fellowship of Nigeria. Can we shift from the remarkable story of your meeting and early work to where you are now, in October 2011? Where do you see this interreligious work moving, in Nigeria and in other countries? (Ashafa) My experience was that before we started in 1995, there were no interfaith organizations in Nigeria—by that I mean true interfaith. There was not one organization that invited others to a conference in the name of interfaith. Sometimes one organization would invite another to their meeting to discuss a specific topic, but it was clearly on the ground of their community, with no idea of working together as partners. Since we started, interfaith has taken on a new sense that is truly faith based. It is really about common engagement. It is above all interpersonal, a people to people dialogue. People had become resentful (and many still are), full of anger. We are working for compromise and we are motivating people based on the unity of religions. At first, we found people saying no, we are not willing to come on board. It was an abomination when we started, and we felt nothing but loneliness as we saw the needs and possibilities. But today, after 15 to 16 years of work, we have many Islamic leaders who are on board, as advisors or as patrons or as guides for faith-based organizations. They are invited to events and they talk and give papers, and they stress the validity and importance of interfaith as part of religion. There is an understanding that it is not about being Muslim or Christian, it’s not about debates between the two, or winning and losing. It is about dialogue and focusing on issues that affect both of us and how we can move our society forward. This concept simply was not there. But today we are happy that so many Muslims are ready to engage. James faced more challenges with the Pentecostal and Evangelical groups which tended to see interfaith as a sellout. They don’t like to hear the issue of interfaith relations and they reinforce each other’s views. But for me, with the Muslims today, I will tell you that 70 percent are supporting my cause. Of the whole Nigerian or Muslim population? There are about 80 million Muslims in Nigeria and I believe that 70 percent of them support our cause, interfaith work for peace. The Sultan is supportive. We have had discussions with the Sharia Council in my State and the Council of the Ulema, and they all support my cause. However, we have dissident voices and some of they are very loud and strong. They come mostly from the Salafi groups who say that we are betraying and compromising Islam. Why do I smile and meet with these people? Why do I engage them? They are looking at Europe, looking at Christianity, drawing their views from the actions of America in Iraq or in Afghanistan. They are looking at Christianity from the perspective of the action of the NATO forces in Libya, the response to Qaddafi. So they are judging their reaction to interfaith work based on international, political dimensions, and therefore their feeling is really relevant to what we are trying to do. There was an important exception that came when I was seriously injured in a car accident and had a spinal injury. We were all looking frantically at how to get treatment, because it would cost at least £100,000, and an air ambulance was needed. The money could not be raised locally. And so we had to look for money. How do you get the £100,000 for me to pay for the operation and transport? A first offer came from a friend in Israel. As soon as my team heard “support from Israel,” they were opposed. If I went to Israel they would inject me and I would die: the phobias grew stronger. The next idea was Saudi Arabia, then Germany. People from many faiths, like-minded people were involved. They put an SOS on the website, and a Muslim Arab, who had seen the film (The Imam and the Pastor) offered to help, He wanted to remain anonymous and he paid for everything. We still had trouble because of the anonymity, and there was lots of blah blah blah, but when they heard that it was an Arab who had paid, it was okay. The reaction shows how strong the notions and stereotypes are and how much they challenge our interfaith work. So where do you think things stand today? (James) They are still quite challenging. The new leadership we have in the Christian church body comes from the Christian Association of Nigeria (CAN) and he challenges our interfaith premises from time to time. And the fact also remains that there have been attacks on churches in Maiduguri and elsewhere. When that happens, the new Christian leader of the Interfaith Group (Ayo Oritsejafor) has come out to condemn those acts, in strong terms. It created some tensions in relations with the Sultan and that has needed some mediation. During a meeting of NIREC (Nigerian Inter-Religious Council), he speaks in strong and blunt terms, and is direct in asking the Sultan to demand that his supporters stop such violence. That is the way he works and the Christians radicals are quite happy with him for now. He is charismatic, and he has visited the sites of trouble and church burnings, and has brought aid to the people who have suffered. Archbishop Onaiyekan (he was the previous Christian representative) was not doing that. His reaction was more to speak in peaceful terms, saying, “Okay, let’s keep the peace and look together at what happened and what can be done.” That is why some of the less moderate Christians saw him as a leader who stayed in Abuja, who did not travel. Those were some of the things they held against him when it came to the elections. So that is the reality. But he really is supportive of the work that we are doing. He’ll say, “What is that friend of yours, what is his name? And I’ll say “Imam Ashafa,” and he says “Yes, how is he?” So, it’s not that they are completely closed or opposed, but they face the realities of the current situation, so it is a complicated relationship. I was appointed by him to oversee the work for peace within our denomination, the Assemblies of God, which is the fastest growing denomination in Nigeria, and the new Pentecostal umbrella alliance. Bringing this group together is not easy because they really are many pockets of individual churches. The system is not like we have in the Catholic or the Anglican/Episcopalian churches, where there is a clear hierarchy and community. Funds have been given to the University of Jos to study Pentecostalism in Nigeria and what they would need to coordinate their activities as one body or to base cooperation on some kind of principles of order and guidance. But there is a long way to go before that happens. So this is our situation, on the Christian side, in a very summarized form. I have plenty of problems as I try to move forward towards peace. Clearly you both face issues within your Muslim and Christian traditions, both in their ways quite fragmented and divided. What about non-religious, underlying causes of tensions, which you both talk about? The Sultan once spoke in Washington and his message was that the problem was “jobs, jobs, jobs.” Do you agree with his diagnosis? (James) Northern Nigeria is hit the worst of all regions of the country by poverty and unemployment. One estimate is that about 70 percent of northern people are living below the poverty line of $1 a day. The banks face serious problems. Therefore most people are not engaged in productive and profitable work. That causes massive problems. If there were both good mass education and massive increases in jobs, that would reduce the poverty, and it would also reduce the free hands that now can be recruited for violence, in northern Nigeria in particular. So I agree with the Sultan that poverty is problem number one, and that while a few people are very rich, far more people are very poor. Nigeria is far too dependent on oil money, but that does not bring about development. We have even stopped doing agriculture, which was our mainstay. Now everybody depends on the oil money that comes from the federal government down to the local governments. The flows or non-flows of money also fuel tension. Some people today are calling for a new national dialogue leading to a new, true kind of federalism. Should we be the federation that benefits the very powerful, or should we return the power to the grassroots? Recently, just last month, the national Parliament for the first time said the money that is to go to the local government should not pass through the state government. It should go directly to local governments so they can be empowered and thus really reach out to the people. So there are both of these obviously fraught dialogues ongoing, and they reflect the serious economic and political challenges facing the country. Then religion comes in and it is a vehicle that is used to market these differences quickly. In the churches and the mosques, people can stand up and make pronouncements, and you can set the country ablaze after just one sermon on a Sunday or one prayer speech on a Friday. A sermon will point to the fact the hospitals do not have drugs, and that the lights are not working. And then that there are so many resources in the hands of a few politicians, who are screwing the people. I think we have the highest paid members of parliament in the world, though some people are saying that Kenya has overtaken us; in any event a Member of Parliament in Nigeria makes considerably more than an American congressman and they display it by buying cars and parking them, just as you might line up the shoes in your wardrobe, seven cars at least for just one man. And people see it. In the universities, people say that they have to pay but they are not getting even a basic education. The educational system is revolting, the medical system is on strike. So people ask why the MPs get so much, and the MPs say now, “Well, okay, we’ll let go of some of our salaries.” But then they didn’t let go of their allowances, and the allowances are quite big, maybe 10 million Naira a month. That’s thousands of U.S. dollars per month for one individual. As people begin to see that, they realize, oh boy, it’s not spread evenly. I hope that the political leaders address the many constitutional issues we face, like citizenship and our federal system. Should we give power to the local governments that have natural resources or oblige those regions to send resources up to the top? But if that happens, many local governments will close down because they simply do not have the resources to maintain the system and to operate if they don’t have money coming from the top. That kind of federal system will make some local governments, those that have the oil, extremely rich. So that generates tensions. It’s quite a complex political situation. And religion and religious people can make it worse, or they can work to help resolve it. When you say resolve it, what do you mean? (James) For instance, if I want people to pay a tax, I can tell them, "God says if you don’t pay a tax, you are going to Hell." If I want people to obey laws, wear crash helmets or wear seatbelts, have proper license plate numbers, I’ll say, “if you don’t do it, you go to Hell.” So we begin to reach them in their consciousness and also their consciences; and they begin to change. So if you want any positive change in our country, you use those people, the preachers. If you want development, sometimes American people will give several billions in aid. It never gets to people because the government takes some and they begin to share it. But when it goes to relatively religious people, they can be checkmated and the aid money can really go down to the people. So it’s a channel to bring about positive change. Are there religious leaders in Nigeria who are respected by all Nigerians, in all regions and all religions? (Ashafa) For us, the Sultan is one voice that is respected across the country. His is the only voice that can carry across the land. Most of our religious leaders have either local voices or organizational voices within a specific organizational framework or institutional framework. Today is the day of Eid and it is the Sultan who announces when the Eid is and when the Eid should not be. There will be a few, but very few dissenting voices, who will say, “I’m not going to accept his dates, I will do it another way.” The dominant majority of Nigerians, 90 percent of Nigerian Muslims, will always follow the Sultan’s instructions. For us he is the spiritual leader. What about on the Christian side? (James) Ayo Oritsejafor has generated a lot of support. There are, however, some disagreements between him and the Catholics. The Catholics were not too happy that Onaiyekan was removed. But at another level, they have to accept him if he represents their, that is the Christian, voice. They have to do what the church community says, and their numbers are not more than all the other denominations together. (James) The Anglicans work together with the other members of the Christian group. There are basically five denominational groupings in Nigeria among the traditional Protestant Churches. It is only the Catholics that see themselves as conspicuously different, with different challenges. But when we face the outside, we are all as one big denomination. The Anglicans, other groups, the Evangelicals, the Pentecostals, the African traditional churches, all are within the group and work pretty well together. Are the African traditional faith groups part of the alliance? Nigerian traditional religious leaders were prominent at the Pope’s recent gathering in Assisi. (James) Most of the African churches are led by mostly Yoruba and they are quite closely linked to the older spiritual traditions. So, generally speaking, the Christian’s single voice is Ayo Oritsejafor. The Catholics would not come out and say this but underneath there was a lot of pressure to bring back Onaiyekan, but the other four groups did not see him as representative. Many who see your films and hear and are inspired by your example ask how you work with women. Are they truly part of your efforts? What more can be done to bring them into the processes? And to recognize their work? There are women doing important work but we have to work with the realities of the situation and in religious circles men are still at the center. You are doing much work beyond Nigeria today. What are the countries you are focusing on? And what kind of work do you do? Where do you find the most resonance? Many! Nigeria, Kenya, Egypt, Sudan (north and south), Burundi, northern Kenya, northern Ghana, Sierra Leone. Recently we did an intervention in Lebanon. Our work is rather different in each country. Sometimes we will show the film, other times do workshops of different kinds. What gives you the most hope for the kind of work you do? We have much hope in Kenya, in Burundi, and in Sudan, north and south, because in all three we are now engaging the government. In South Sudan, it is truly a fresh start and we supported the government as they were setting up the new government. And we will continue to work hard in Nigeria! Nigeria's Kano State and US drugs firm Pfizer have agreed to settle a multi-million dollar lawsuit out of court, lawyers for both sides say. Pfizer has been accused of killing 11 children and injuring 181 others when an antibiotic was tested on them during a meningitis epidemic in 1996. The company denies the claims, saying they were victims of the outbreak.